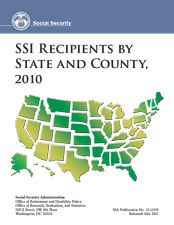 County data on Supplemental Security Income (SSI) are a measure of the local impact of the program. This report is a resource for Social Security Administration (SSA) staff in formulating policy and for local service providers and economic planners. The SSI program is a cash assistance program that provides monthly benefits to low-income aged, blind, or disabled persons in the 50 states, the District of Columbia, and the Northern Mariana Islands. The states and other jurisdictions have the option of supplementing their residents' SSI payments and may choose to have the additional payments administered by the federal government. When a state chooses federal administration, SSA maintains the payment records and issues the federal payment and the state supplement in one check. The data presented in this document are for federal and federally administered state payments only. State-administered supplementation payments are not included. The tables present SSI data by eligibility category (aged, blind, and disabled) and age. State data on the number of recipients and amount of payments are shown in Tables 1 and 2, respectively. SSI recipients who also receive Social Security (Old-Age, Survivors, and Disability Insurance) benefits are shown in Table 1 and in Table 3, which presents data at the county level. Beginning in 2009, Table 3 includes a column that lists the American National Standards Institute (ANSI) code assigned to each state and county. Stella M. Coleman in the Division of SSI Statistics and Analysis programmed and compiled the data for this report. Staff of the Division of Information Resources edited the report and prepared the web version for publication. The data in this report are drawn from the Supplemental Security Record, the principal administrative data file for the Supplemental Security Income program. State and county payment amounts are rounded to whole dollars. A state payment amount may not equal the sum of the county payment amounts because the state total is derived by adding unrounded county payment amounts. The amount of payments if the amount is smaller than a predetermined threshold. Additional cells may be suppressed regardless of their value to prevent derivation of suppressed table cells by subtracting from totals. State totals include all county numbers, regardless of whether individual county numbers are suppressed. Please see Tables 1 and 2 for totals. Contains all the counties and independent cities in one table without state-level subtotals, and includes D.C. and the Northern Mariana Islands.